Gently remove your face and eye makeup with a calming blend of coconut oil, lavender and chamomile that treats your delicate skin with kindness. Saturate damp cloth with remover and apply to face and eyes in a circular motion, then rinse well with warm water; pat dry. Safe to use around and on eyelids; avoid getting directly in eyes. 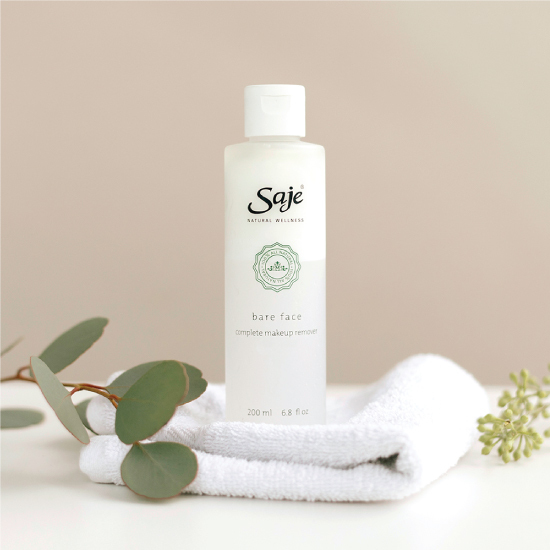 Follow with favorite Saje cleanser, toner and moisturizer recommended for your skin type. Soothing and refreshing; promotes moisture balance in the skin. Gently removes makeup while nourishing the skin and promoting regeneration. Fractionated coconut oil to gently dissolve and remove makeup with ease; aloe vera to moisturize, cool and soothe the skin; lavender to calm, balance and hydrate before cleansing. Fractionated coconut oil is a liquid, non-greasy emollient that easily penetrates the skin, helping you to absorb the benefits of plant-based ingredients. With its naturally balancing and cleansing properties, coconut oil gently moisturizes the skin without clogging your pores. Shake vigorously before each use to combine plant-based oils and water. Then, saturate washcloth with remover and apply to your face and eyes in a circular motion. 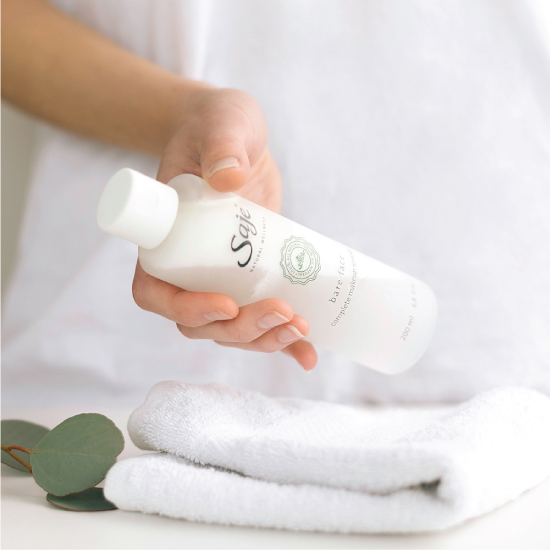 Next, rinse well with warm water, pat dry and follow with your favorite Saje cleanser, toner and moisturizer for a complete skin care ritual. #SajeTip: For added effect, after applying Bare Face to the skin, use your favorite Saje Konjac Sponge to further blend in and remove makeup. When this product first launched, I was a little skeptical. I've never been one for makeup removers because many of them get into my eyes and sting. When I used this makeup remover, not only did it NOT hurt my eyes at all, it removed my very hard Diorshow Mascara!! Usually I have to scrub and scrub to get this off, but a couple of swipes did it! I will recommend this makeup remover over any other removers any day. Just make sure you shake the bottle before you use it!